There you go and if there's anyway for you to give me some sort of hint or help to be able to play your game (cause I've been itching to play it but I sadly just can't), It would be greatly appreciated. It says "you may solve it by installing newest DirectX". We'll spend our time for new game. i download you game and i think is bored, the pixel art is cool but the history i don't know. Thank you for making this game. Thank you for bringing these things to light and giving people who suffer from such horrors a voice. You are an incredible person... just... thank you. Hello what language was this used with? VB? C++? Wolf RPG Editor? Also will u be making future games? Loved the mature/dark themes in this one. We'll try to make new one by December. Yatta, arigatou! From Japan? So many web 2.0 sites! At first, I thought the game is about the hikikomori phenomenon, but it turns out otherwise. As someone who is (unwillingly) stuck inside a small room every day, the banal horror implied by the line "X is home, so I can't leave the room." cuts very close. Ultimately, I'm glad for the game's protagonist that his X is not a cruel monster disguised as a self-serving human. The game's message is good to bear in mind, for poverty-induced neglect &/or social isolation is very real indeed, even if most people are blissfully oblivious to it. Hey, I just wanted to let you know that your game got on my top 10 list of 2017! Very cool. I'm not 100% sure I understood it all but it was definitely an experience. A very well put together game in both story and gameplay! Almost teared up a little bit too. I got all the tips and endings! Absolutely love the game. As someone who has been in closely the same situation, the character's plights felt real and very serious. The music complimented how tightly, yet loosely the character was holding on to the will to live. Beat it, but didn't get one of the clues. Nevertheless, hope to see some more games like this out of you! This game was amazing but also very simple...and I think that's what makes it great. Simple game, but it really did leave a mark. Great job for everyone who helped make this game possible! Ahh, this is such a deep game. I really connected with a lot of the issues being raised, and it really touched me. I'm looking forward to playing this again when the text error has been corrected, but in the meantime thanks so much for making this, and keep up the great work! I am blown away by the story this game tells and the attention it draws to a number of social/economical/psychological issues. I collected all of the tips and "failed" a lot. But I eventually got an ending I was satisfied with. I love that the gameplay loop is so simple and restrictive, but that the narrative is so powerful. Unfortunately, the version I played has an issue with text getting cut off so I had to guess at what was being said, sometimes. Still, a delightful and dark experience that speaks of real issues. 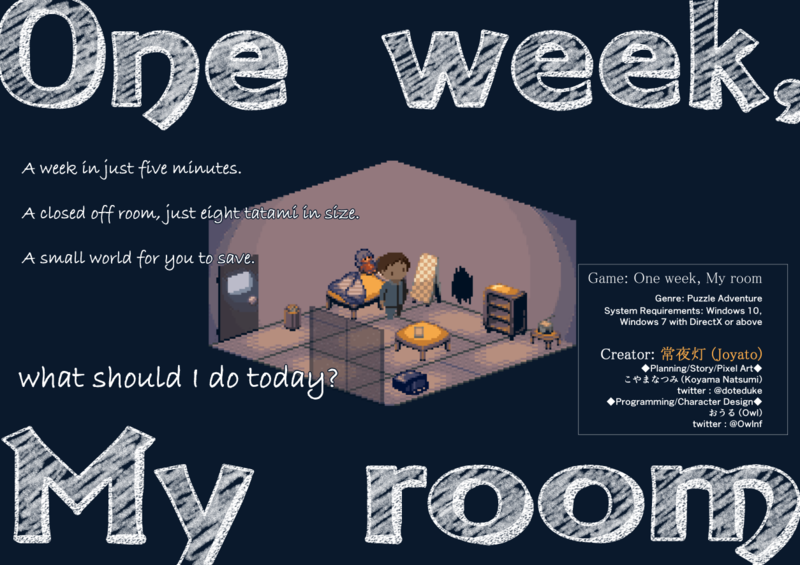 CANT BELIEVE I CRIED | One Week My Room Game - This game really had me in tears. I'm glad it had a happy ending but with suicide in the limelight at the moment this game shows an important message... someone is there for you. This is really a great game. It's simple, but tells a story very well even if it's a sad one. On another note, how do I get tip 9? That's the only one I don't have unlocked. Perhaps some choices are missed. Wow, its dark, but thats what makes it work... Amazingly thought through. HOW DO I MAKE THE SCREEN BIGGER sorry caps >:( caps beacuse the word go off the screen? 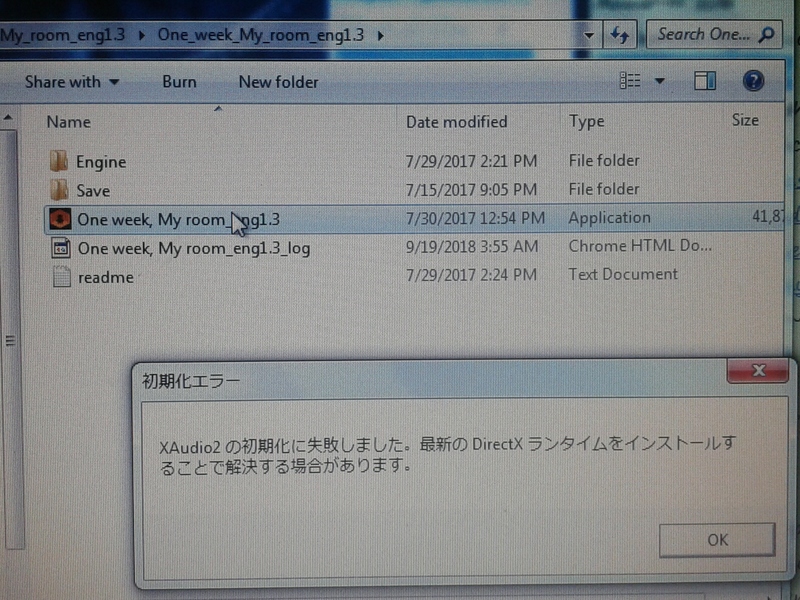 At ver 1.3, we'll fix the problem that the word go off the screen. This game was more than I expected. I can't wait to unlock all of the tips and find out more about the story. This is an interesting game, it definitely has some very dark themes to it, but that's what gives it its character. The art style's quite nice and the accompanying music is great. It's simplistic in its gameplay, but complex in its meaning. If things are done in a certain order I'm assuming the end turns out much differently, I would like to think that in my playthrough I got the "good" ending but that's up to interpretation. The only issue I had was that sometimes the text would run off the screen, I'm not sure if it was a bug or because of my screen resolution, either way, I didn't let it take away from the experience of the game's core message. It's a game that makes you stop and think about things. I quite enjoyed my time with it. I hope you don't mind but I recorded a short let's play of the game. I rather enjoy the simplicity of the game so far. It's short and relaxing gameplay wise; although, the undertone of the big brother bit is pretty startling. I loved this! Just one question, how many endings are there? I unlocked all the tips and got three endings (SPOILER: balcony suicide, balcony with mom, getting eaten by "big brother"), is there another one I've missed? So many questions after playing... :) Were the tips supposed to have more information? Hmmm your version of the game seems to be a bit buggy. The tips aren't supposed to be empty, and your mom is supposed to show up on the balcony after you slipped the diary under the door. Are you playing version eng1.2 ? If you send us mail, you can get txt files of Tips. Or, if you copy and paste your savedata.bin, you can read Tips in new version. It almost looks like a sad game, but so glad the ending isn't bad! Thank you for your playing!